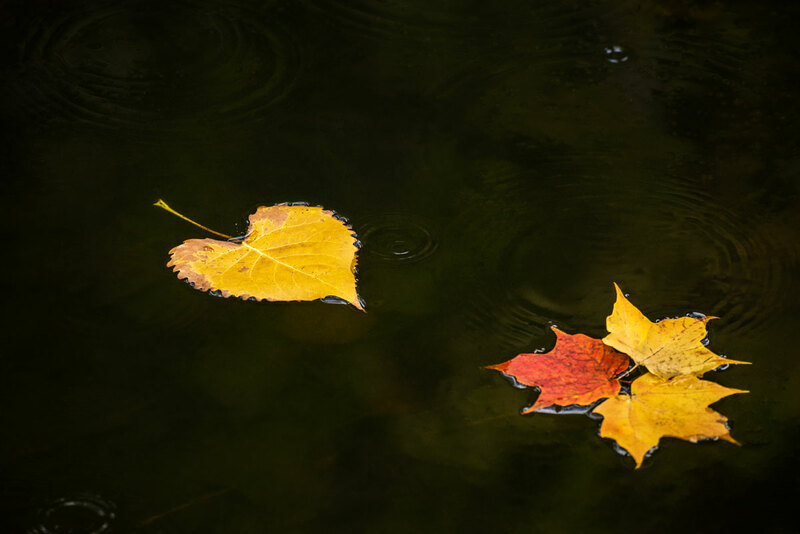 Autumn is all about leaves on trees, falling to the ground and on the water. A large number of tall trees tower over a creek near my house filling it with leaves. When I walk the path along the creek I always look through the viewfinder in my camera trying to find an interesting composition in the chaos. I could see this simple but compelling composition under a lot of reflected highlights and debris in the water. So it was a time-consuming project to clean this image up in post processing. The image is more complex than it looks at first glance. There is autumn colour, lit against the beautiful green water and blurred leaves nestled underneath the water. Please click on the image to see the enlarged version which I think shows the light to its best advantage. There is also round ripples in the water adding texture and interest to the dark background. A beautifully simple composition and well worth the effort in Lightroom! Nicely seen and shot. Reflected highlights in water can be very difficult to deal with. They certainly can, so you have to decide that the image is worth the effort. Thanks Lignum. Love the shot! And the colors! I love fallen leaves. Your picture is beautiful. Oh that happens. That goodness for digital. Sorry I just realized that Allen is your last name and I am definitely a digital girl. No problem on names. I spent many years in Asia were it was common to call people by their last name without prefix.